Jackson Creek automatic feeders are the ultimate in convenience and dependability for the care of pets. Our feeders feature a swinging door that automatically closes when the pet’s head is withdrawn. The door protects against birds, flies, and rain. Jackson Creek feeders are built with quality craftsmanship and materials and are available in 6#, 15#, 25# and 50# sizes. 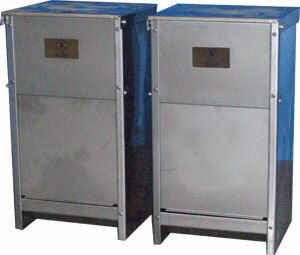 Last but not least, our feeders are made of 100% galvanized steel because…DOGS EAT PLASTIC!!!!!! Now offering 25# stainless steel feeders. 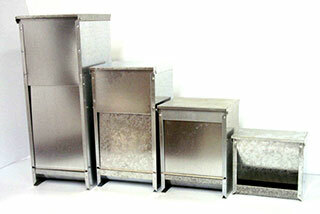 Stainless steel will not rust like galvanized. You will pay more for this feeder but you should never have to replace it so it is cheaper in the long run. Limited availability. Price $42.00 each.